Cellular level art, paint on silk, digitised. 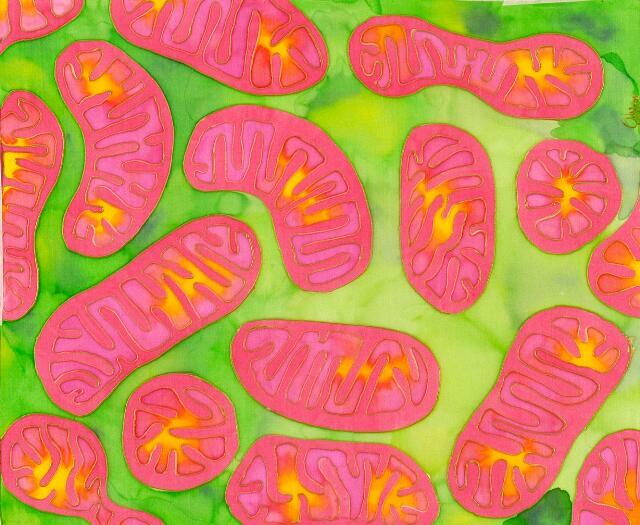 Mitochondria generate the energy that our cells need to function. The energy made by the mitochondria is in the form of a chemical called adenosine triphosphate or ATP. This image shows the often bean-shaped mitochondria as viewed under the microscope. We can see two membranes (protective coverings) one surrounding the other, called the inner and outer mitochondrial membranes. The inner membrane has folded structures called cristae. Between the two membranes is a gap called the inter membrane space, the space surrounding this is called the matrix.